Without going into too much horrific detail, I’ve been sleep training our 7 month old on my own, my husband has been away a LOT and in short it’s been exhausting and emotional, but also lovely to wake up and not feel like i’m sleep wading through another day like a total zombie. Just a little bit of a zombie. Which is fine and much more manageable than dealing with a sleep deprived toddler – one that has grown out of afternoon naps and sadly isn’t really old enough to medicate with double espressos. Anyway, don’t get me wrong I fully realise how lucky I am – I’ve been sent some completely rubbish things but also some pretty wonderful things to blog about over the years. One of the very best has to be this silver box of gorgeousness from Colchester Oyster Fishery. The result? Some of the sweetest lobster meat I’ve ever eaten (although I must admit to not having eaten a huge amount in my life) which paired terrifically with the curry sauce, a sauce that managed to be both complex and fragrant without being overpowering. Basically, a bloody triumph and one of the best meals in I’ve ever produced. By heck it was good. 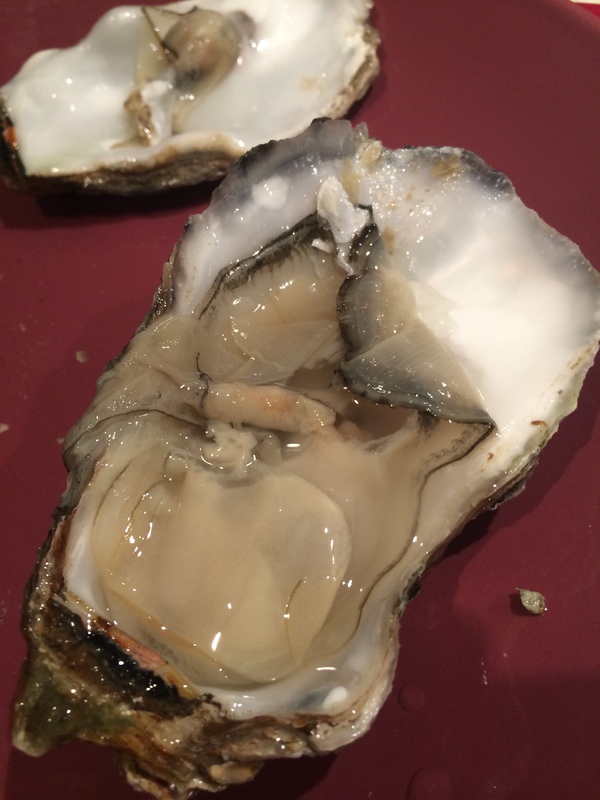 The oysters were fat, minerally and needed absolutely nothing bar the merest whisper of lemon juice. If you’re considering blowing a bit of dosh on some shockingly fresh seafood delivered right up to your front door in a fetching silver box with some frozen block things, then you can’t go far wrong with these guys. 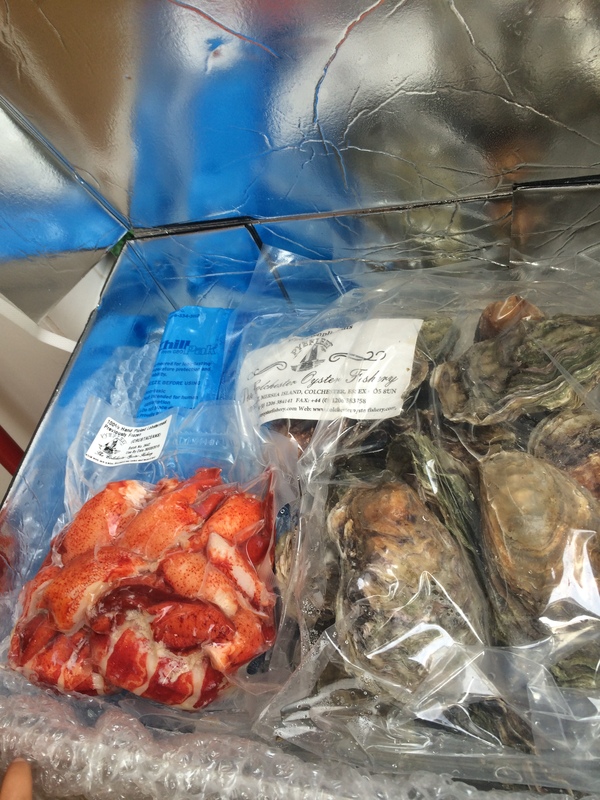 Thanks to Colchester oyster fishery I am one sleepy but extremely happy mama. you need to make sure you cook everything out properly at every stage for this. So brown the onions for ages over a low heat and simmer the sauce properly before adding the seafood. -heat the oil in a pan and add the mustard seeds, cumin seeds and once they’ve started popping, add the curry leaves. – add the dried chilli, garlic, ginger and shallots and cook low and slow until everything is translucent and smells wonderful. -Add the curry, chilli and turmeric powders, stir and keep going for another 5 minutes or so until the spices have started to cook out. – Then add your tomatoes, tamarind and half the stock and simmer for another 10 minutes. -Add the coconut milk and remaining stock and simmer for about 15 minutes. 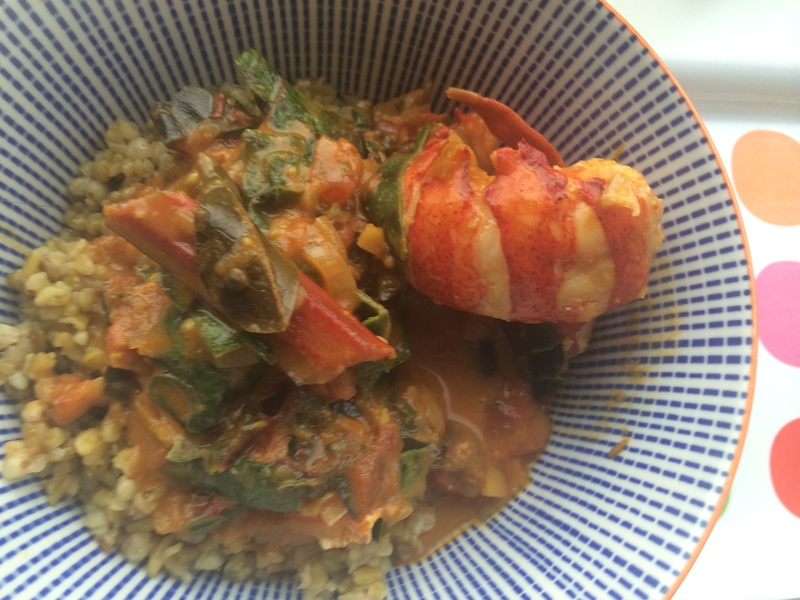 Throw in the lobster and the chard and cook for another 5 minutes or until the stems have cooked through. -in a pan, melt the butter/ghee, and when it’s foaming add the cumin seeds and garlic. 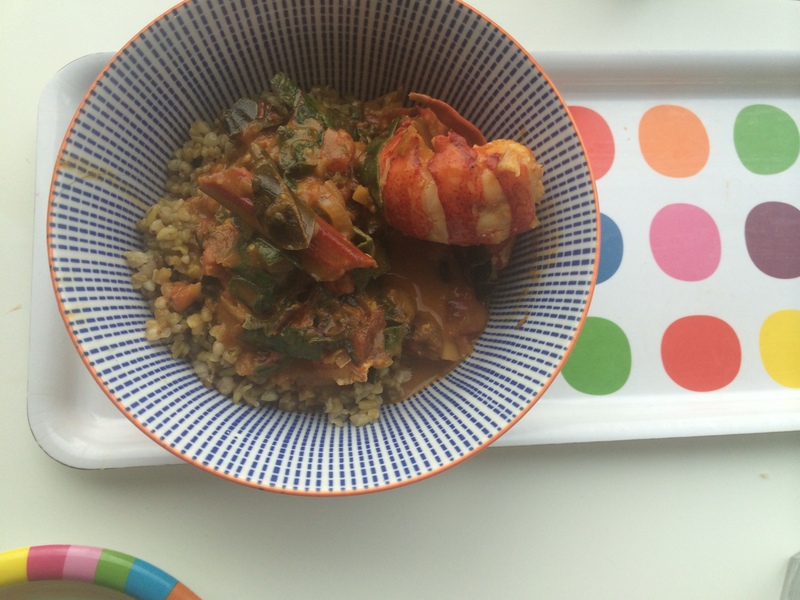 -Pour in the buckwheat and freekeh. Add vegetable stock and simmer for 20-30 minutes.